I see that this shows shopping as “convenience stores” . Does that mean 7-11 and the liquor stores and similar or does it include the all the other types of shopping? That is odd that convenience stores were separated out. But fear not, the principle is the same! 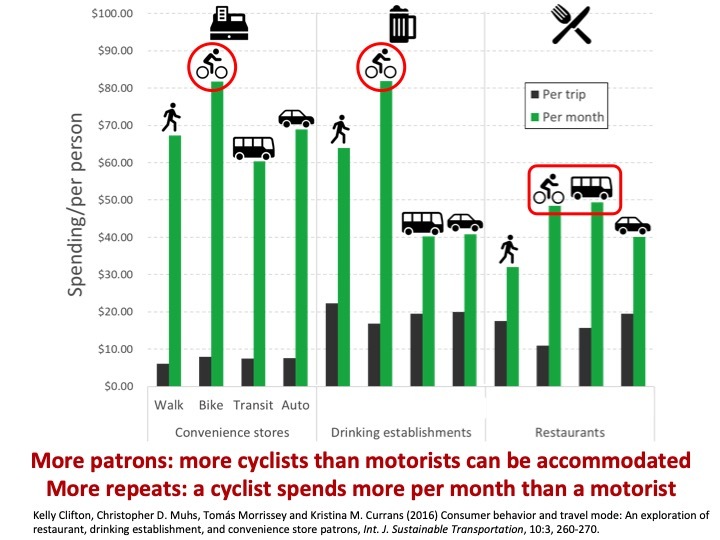 There have been many studies, https://www.citylab.com/solutions/2015/03/the-complete-business-case-for-converting-street-parking-into-bike-lanes/387595/ , from Davis to the East Village to Vancouver to Ireland to New Zealand to Los Angeles to the Pacific NW, showing that customers arriving by bike spend as much as or more than customers arriving by car. Your gallery/store is on Albany’s “Main Street,” across the street from a regional bike/ped trail. If it’s more comfortable to ride and walk by, people can, do and will stop in!